This is the Year of Tile when it comes to bathroom design. Designers are finding the perfect balance of durability, timelessness, and modern elements. From the floor to the walls, this year’s tile choices are sure to make the bathroom stand out. This year is all about shape. Geometric tiles are making a comeback, but this time with a modern flair. Boring square tiles are out, while hexagon and round tiles are in. 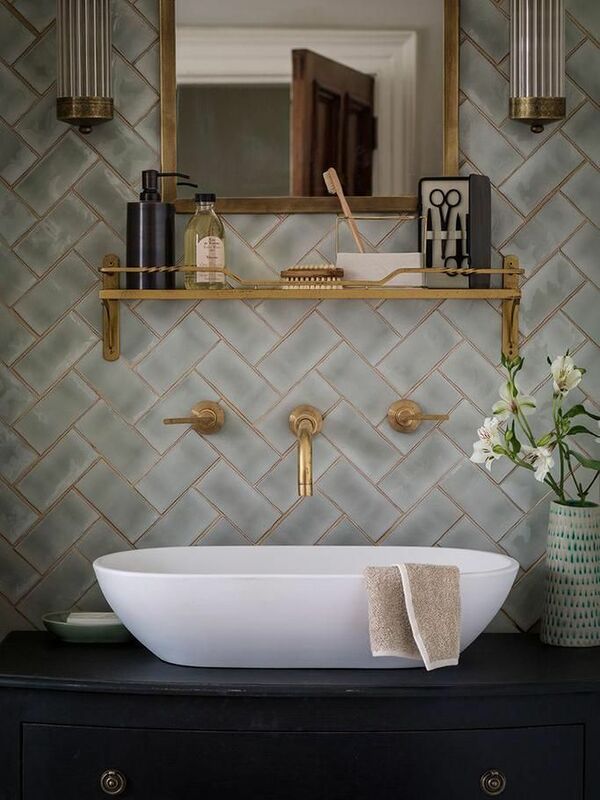 Subway tiles and thin rectangle tiles are also popular when laid in surprising designs, from herringbone patterns to a simple diagonal placement. The most popular materials underfoot are ceramic and glass. This is in part because of their durability and easy maintenance, but also because of the amount of light and beauty they bring to the space. Neutral tones, including pure white, gray, black and pale pastels, are teaming up with a few bold colors to create timeless beauty. Colorful glass accents in borders or interspersed in a neutral geometric design, for example, add a pop of color. The days of the all-in-one fiberglass shower surround are fortunately behind us. Tiles are the thing now, but not plain subway tiles or white ceramic. The same pale neutrals making a show on the floor are continuing up the walls. The beautiful textures and natural colors of stone are also making a stately appearance in the shower surround. Stone is popular not just for its beauty and durability, but also because of it’s water absorbent nature. If you aren’t sold on stone, ceramic and glass options are also in vogue. Consider small ceramic tiles in an interesting shape, such as hexagon. 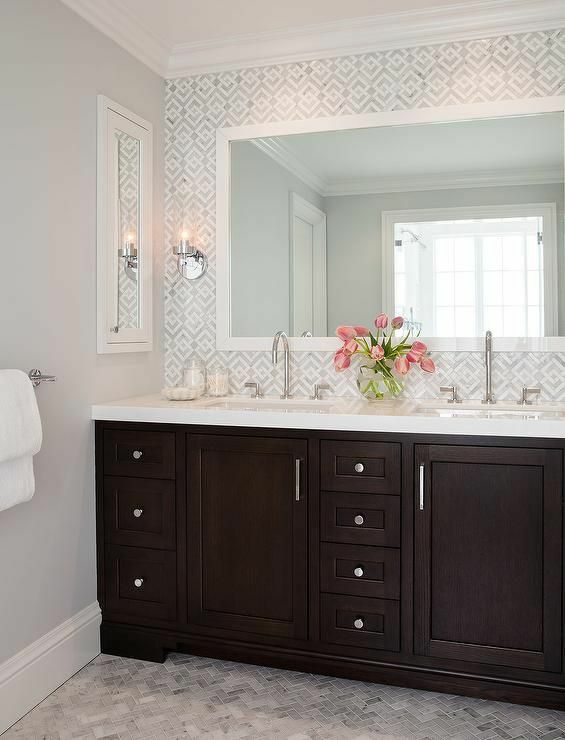 Go for a bold color, like black or dark gray, combined with white grout for geometric beauty. For a more classic look, neutral tiles with iridescent glass trim and accents provides timeless beauty. Your vanity backsplash is a chance to make a statement in your bathroom. Tile mosaics are making a comeback, whether it’s just a simple color pattern or an entire design made from glass. Mirrored tiles, alone or interspersed with other mosaic tiles, add light and a feeling of spaciousness to the room. 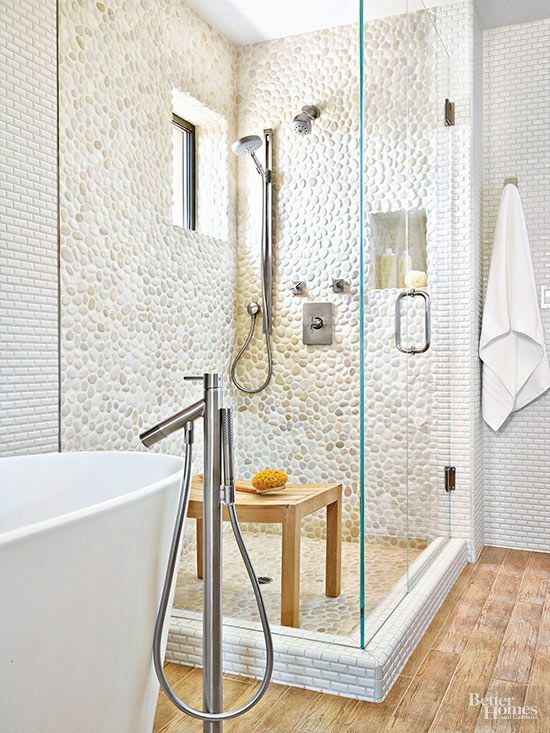 For a clean look, textured translucent glass tiles in pale colors are another on-trend option. To tie in the look behind the sink to that in the shower, you can repeat your tile choices, or use the same shape or geometric installation pattern. Your backsplash is where your personality will really come through in your bathroom. Whether you’re leaning towards country-style or something trendy, there’s a backsplash tile option for you. Just be yourself and see what happens!